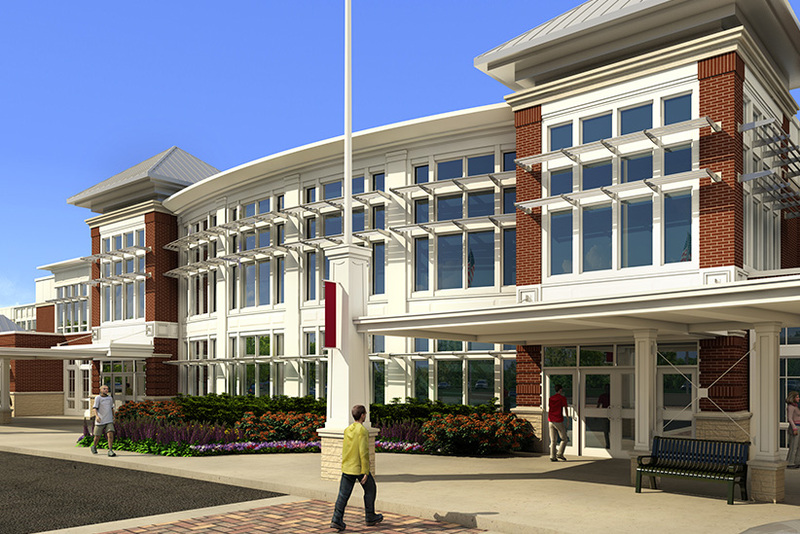 Frequently referred to as “three schools within a school”, the design of the new Abington Co-located Middle / High School and integrated Pre-Kindergarten is sensitive to the Town of Abington’s strong desire to maintain clear separation between program elements within the building, while allowing for cross-discipline collaboration when appropriate and beneficial for student development. The building is organized with two separate “wings” with centrally-located “community program elements” such as the auditorium, arts, music, and athletic facilities between the wings. The two-story middle school wing is further separated into “learning communities” with grades 5/6 on the first floor and 7/8 on the second floor. Each “learning community” is designed to include a centrally located, visually transparent and highly flexible “hands-on project based learning laboratory” where students can research, analyze, problem-solve, explore, communicate, collaborate, and create. The appropriate environments and amenities are designed within each learning community to greatly aide the implementation of these skills. The site is prominently located along Gliniziwzc Way, a tree-lined boulevard leading to the Town Hall and Town Library. The site is organized to support the program separation integrated within the building design, including a separate vehicular circulation and parking that leads to separate middle school and high school building entrances. Multi-purpose playfields are strategically located throughout the site providing easy and direct access from the building and a balance between hard surface and play surface. The new building is designed to achieve a LEED Silver rating and includes many green design strategies such as an energy efficient building envelope, high performance windows, rainwater collection system, high efficiency mechanical and lighting systems, optimum acoustics within instructional classrooms, and low-flow toilet fixtures, among many others.